When you fish hard in the surf, it’s just a matter of time until you suffer a setback with your waders. Whether thru wear & tear or damaged by hazards. 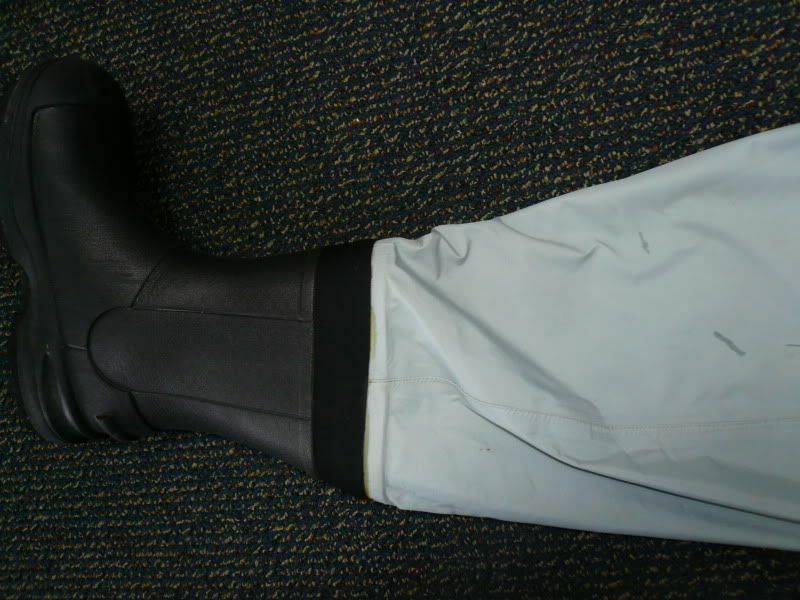 If your waders has a manufacturer defect(s), such as defective stitching or leaky boot seam, they can be sent back to the manufacturer for repair or replacement. Most major brand name waders like Simms, Hodgman or brands carried by the Bass Pro Shops, have excellent warranty and they will work with you to get you back out in the water as quickly as possible. 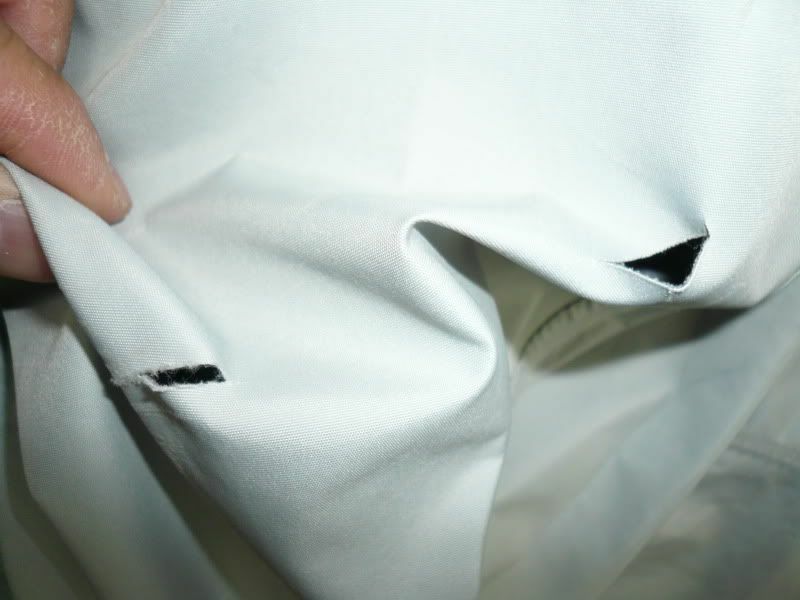 If you damage your waders under normal use, it might faster and/or more economical to do the repair yourself. I slipped on some mussels covered rock and damaged my waders a little while back. Here are the steps that I took to repair them myself. 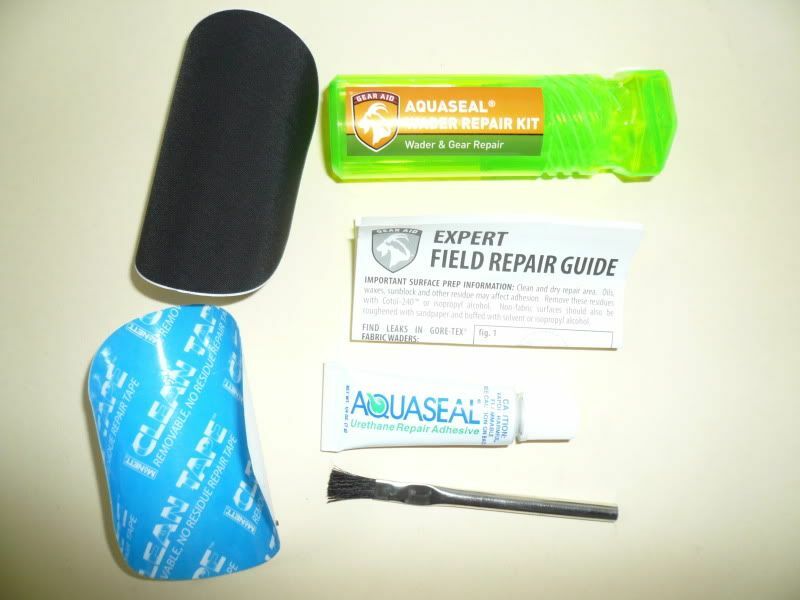 First, you will need to purchase a basic waders repair kit. These kits are relatively inexpensive and can be purchased at most fly fishing specialty shops, on-line or at some sporting goods store like Sports Authority. I purchased the kit below on Ebay for about $10.00. 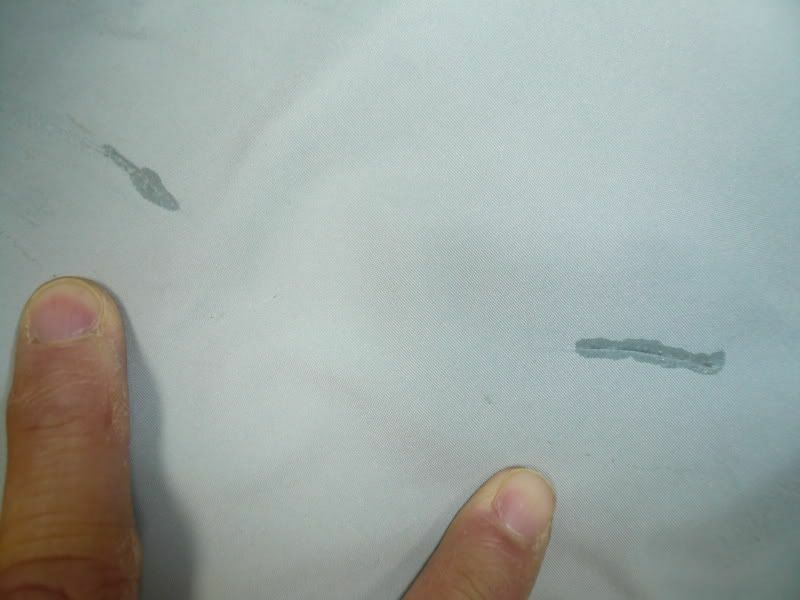 Apply the temporary self-sticking patch to the damaged area. 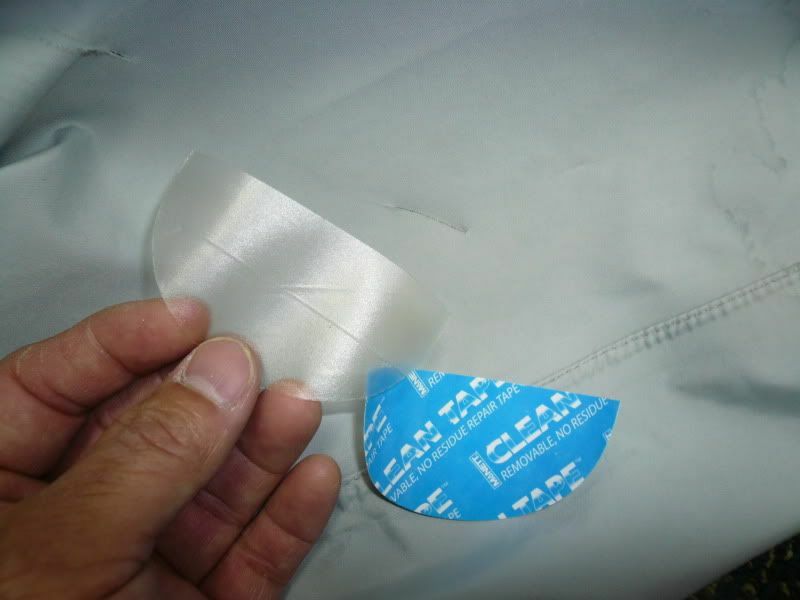 Make sure that the patch covers at least ½ an inch around the entire hole or tear. Here, I cut the patch in two pieces to cover both of the holes in my waders. Apply a generous coat of Aquaseal to the damaged area, making sure that the Aquaseal covers at least ½ an inch around the affected area. Allow to dry in room temperature for 8-12 hours. When the Aquaseal is dry to the touch, turn the waders back to the outside and remove the temporary patch. You are now ready to get back in action. 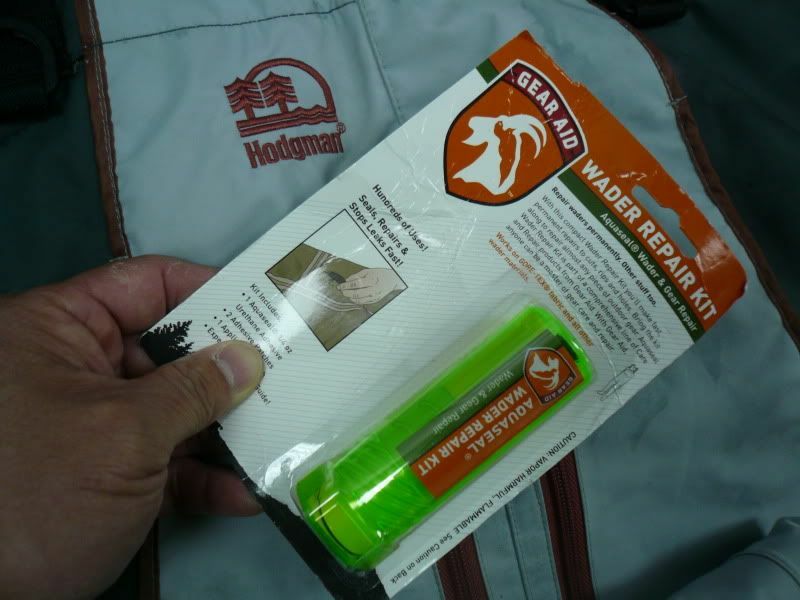 Apply the second patch to the “inside” of the waders on top of the Aquaseal and leave both patches in place. You can continue to fish and remove the patches later when the waders are completely dry. 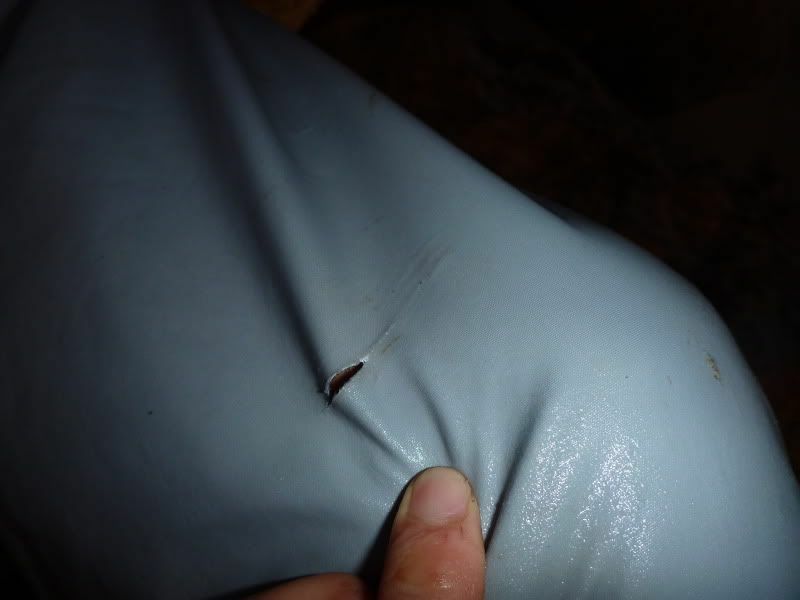 Aquaseal is also good for reinforcing boots seam. The point where the boots are sewn on to your waders. 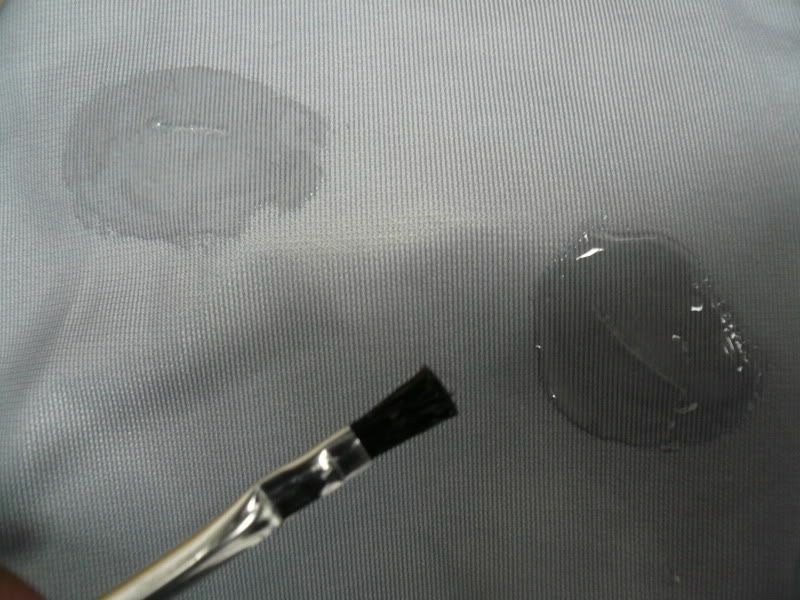 Add a thin coat of Aquaseal along the seams to add extra protection against leaks. "All know the Way, but few actually walk it..."
Saw a really good repair option at the fishing show. 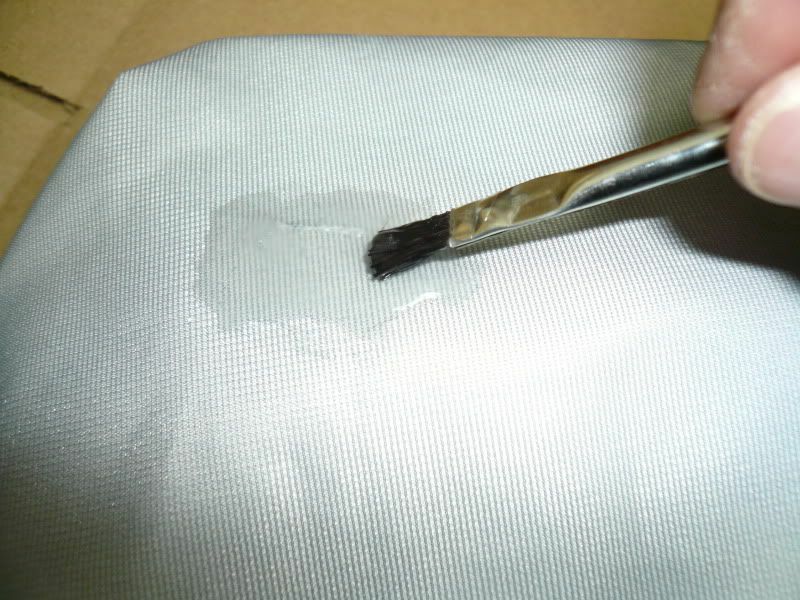 SG 20, www.sg-20.com, It's a flexible/ pliable urethane sealant. Useable in less than an hour, completely cures in 24 hours. Comes in handy dual tube with mixer nozzles. I use this type of adhesive/ sealant at work (which cures hard) and it's the strongest of anything I have found. Plan to crossover this product into my projects at work. I hope that this helps someone out there to not make the mistake I did. I had some leaks at the seams of my Caddis breathable waders. I used Aquaseal to seal the leaks but kept finding myself soaked after sessions in the surf. I was filling the waders with water to find the leaks...BIG MISTAKE! I kept getting leaks and on my last check, I left a leg filled with water for 20 minutes. ALL the seams were showing signs of leaking! Caddis was very helpful and are going to replace the waders, but the woman on the phone said that by filling the waders with water, I had blown out the seams and ruined the waders. If you're going to check for leaks, she said to fill the waders with air and dunk them in water. 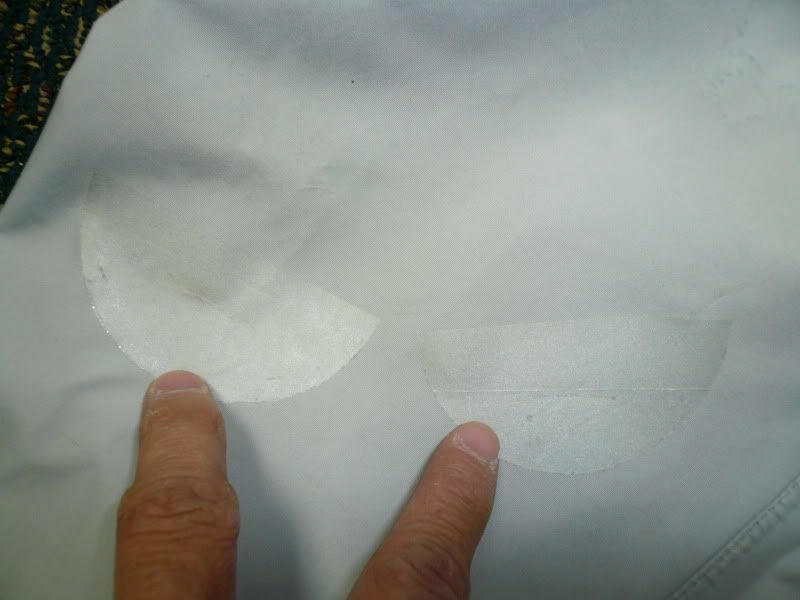 Filling them with water causes too much pressure which will open the seams beyond repair. 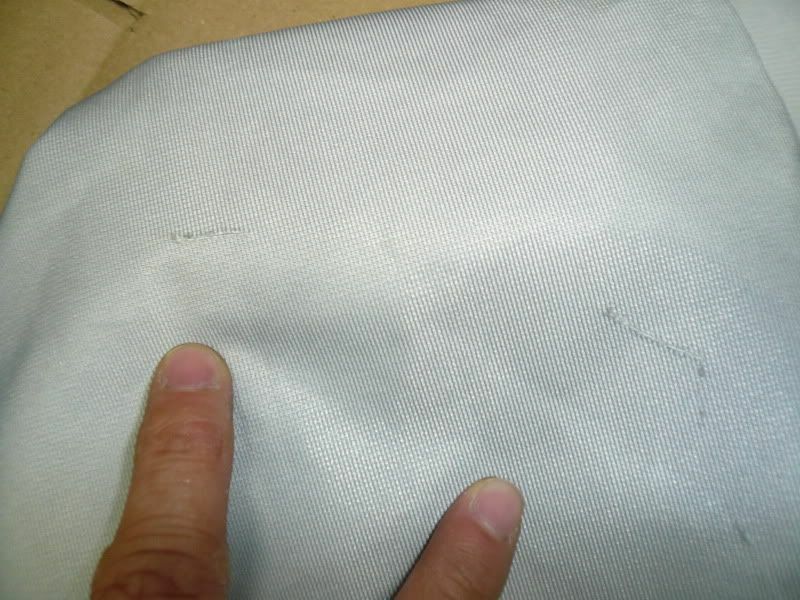 Arthur had mentioned another method of finding leaks that uses a product of Simms that you spray on the suspected area and black spots will form that show you where there are holes. I did a quick search on the web and found that you can use rubbing alcohol in a small spray bottle with the same effect. So, lesson learned, thankfully to no great cost. It took three tubes of Aquaseal and a lot of wasted water, but I guess I finally found out where the leak was...in my head! Good luck and happy fishing! Great post , I have an old pair of Caddis breathable as well with a pin hole in the foot and a leaky seam , so I bought a new pair . Then I read this post , I picked up some aquaseal filled them with air and dunked them in the pool and found the leaks . Now I have a good backup pair .